KANSAS CITY, KS -- A 12-year-old boy died Sunday on a Kansas water slide that is billed as the world's largest, according to officials. ABC News has confirmed that the victim was Caleb Thomas Schwab, the son of Kansas Rep. Scott Schwab. 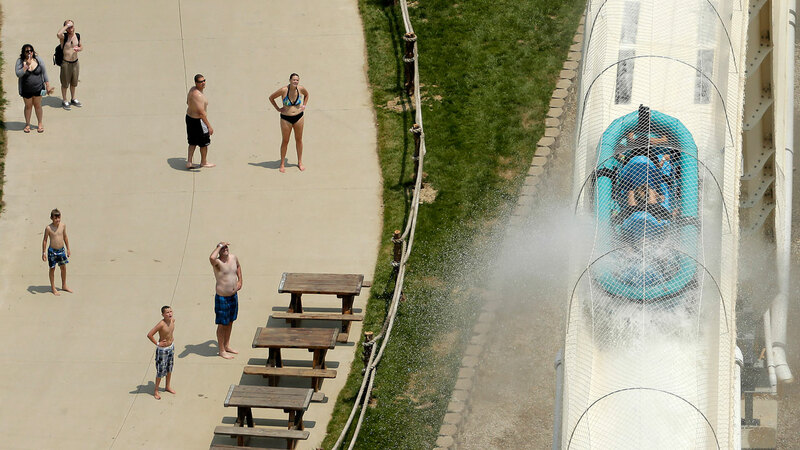 Kansas City, Kansas, police spokesman Officer Cameron Morgan said the boy died at the Schlitterbahn Waterpark, which is located about 15 miles west of downtown Kansas City, Missouri. Schlitterbahn spokeswoman Winter Prosapio said the child died on one of the park's main attractions, Verruckt, a 168-foot-tall water slide that has 264 stairs leading to the top. Prosapio declined comment about how the boy died, saying more details would be released later. The park is closed Sunday and Monday, and the ride is closed pending an investigation, she said. "Our thoughts and prayers are with the family during this difficult time," Prosapio said in a statement. She told reporters at a news conference that the boy's family had been at the park with him. Verruckt, which means "insane" in German, was certified as the world's tallest water slide by Guinness World Records. Verruckt riders go down the slide in multi-person rafts and have to be at last 54 inches tall, according to the park's website. The slide's 2014 opening was delayed a few times, though the operators did not provide reasons for the delays. Two media sneak preview days in 2014 were canceled because of problems with a conveyor system that hauls 100-pound rafts to the top of the slide. Prosapio said in 2014 that park officials would not hesitate to delay operation again for however long it takes to make sure the slide is safe. In a news article linked to the news release announcing a 2014 delay, Schlitterbahn co-owner Jeff Henry told USA Today that he and senior designer John Schooley had based their calculations when designing the slide on roller coasters, but that didn't translate well to a water slide like Verruckt. In early tests, rafts carrying sandbags flew off the slide, prompting engineers to tear down half of the ride and reconfigure some angles at a cost of $1 million, Henry said. A promotional video for a show about building the slide includes footage of two men riding a raft down a half-size test model and going slightly airborne as it crests the top of the first big hill. Prosapio said at the news conference that the park's rides are inspected daily and inspected by an "outside party" before the start of each season.